I saw Gran Torino today and really liked it quite a bit. Clint Eastwood has really proven himself as a great director, but he also stars in this, apparently his last acting job. He does a wonderful job playing the angry, lonely, tortured Walt Kowalski, a foul-mouthed racist who carries around a lot of heavy baggage. The story is one of personal redemption and loneliness, and the film builds to a mesmerizing climax. As with Unforgiven, I did know where this film was heading or how it would turn out, so I watch in rapt attention. Make no mistake, Walt is a powerfully offensive old man, and the racial slurs that fly out of his mouth are both disgusting and wickedly hilarious. He forms an unlikely friendship with some young Hmong neighbors, and the movie sort of deistically ticks away toward the conclusion. 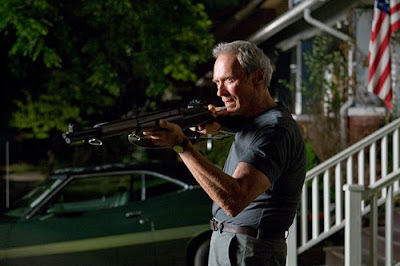 I thought Gran Torino was moving and touching, as well as darkly funny. This film is a great swan song for Clint the Actor, and I think Clint the Director has many great films left in him. i liked this movie, but i thought the supporting roles were really poorly acted. tao and his sister (her name escapes me) i mean. I see multiple capital letters in the post title! It's like the space-time continuum just ripped. I suppose that those are names, now that I take a closer look. If Ding Dong is a name I approve. That's a doorbell special. Clint Eastwood proved himself along time ago and I believe he is on a very short list actors that would pull this part off with such excellence. The Asian kids may not be the best actors but I think they played well. "The only place I get hurt is out there." When a president does it . . .
You never know what's coming for you.